Tracks, tracks, tracks – they’re everywhere in the parks after a good snowfall. 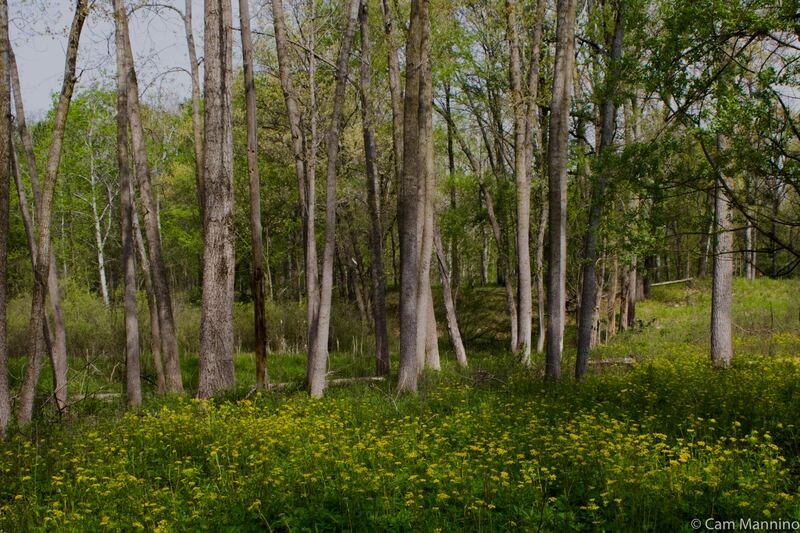 Mostly they’re left by us humans and our dogs, of course, as they are in this photo of the meadow. But sometimes, tracks, distant bird calls, empty nests reveal hints of who’s exploring the park when we’re not there. Or, in the case of gorgeous ice crystals on a puddle, or a huge beaver lodge, we discover what’s occurred when we weren’t looking. Who’s Been Here While We Weren’t? Heading into Cranberry Lake Park with the birders one morning, we stopped at Ben’s urging to listen to the distant call and tapping of a Pileated Woodpecker (Dryocopus pileatus.) (Listen at this highlighted Cornell link under “typical voice.”) These very large woodpeckers make huge rectangular holes as they create nest holes or search for carpenter ants in trees. According to Cornell Lab, the holes offer shelter later to swifts, owls, wood ducks and other birds. 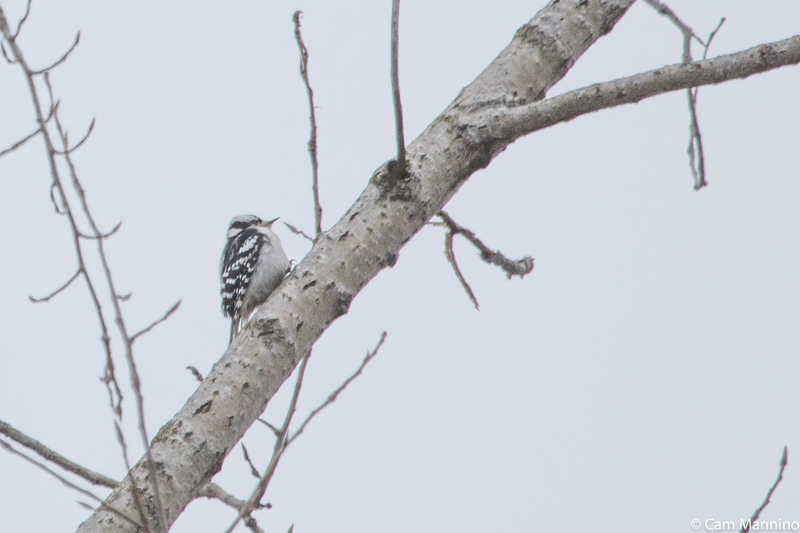 We never got to see this huge member of the woodpecker family that morning, but even hearing it, you sense real wildness close by. Joan Bonin, a township birder, took this excellent picture of a Pileated Woodpecker on a cherry tree in her back yard. Thanks for sharing, Joan! 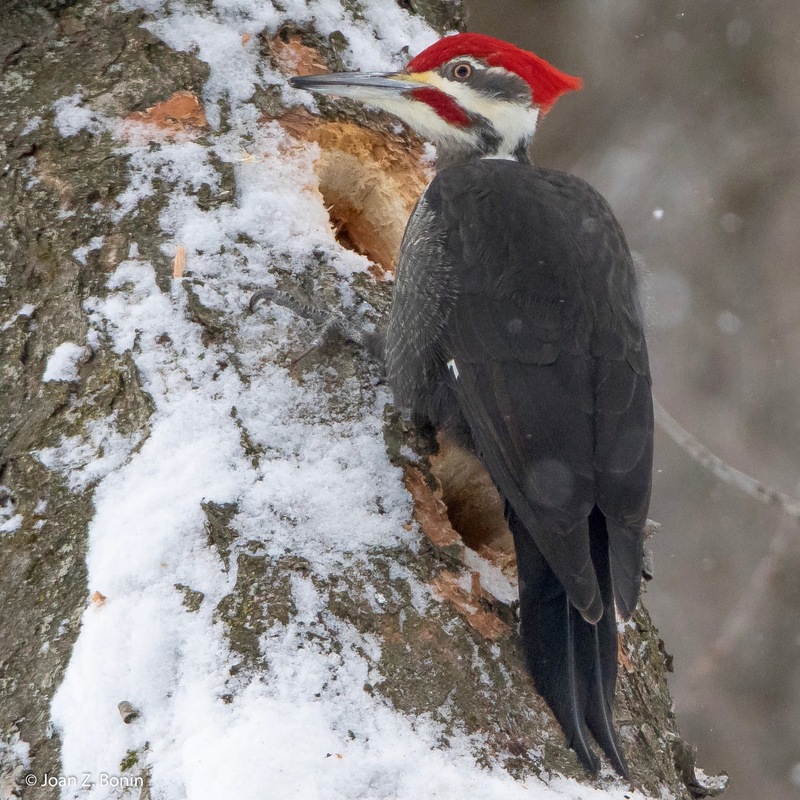 Photo of a Pileated Woodpecker by local photographer and birder, Joan Bonin. The evidence of a bounding rabbit on a wooden platform left by the trail. A hopping rabbit shows how its front paw prints end up behind back paw prints. Rabbit track – the back foot prints are in front. Meanwhile, out in the meadow, a White-footed Mouse (Peromyscus leucopus) must have stopped to explore a clump of exposed grass, and then another. Mice don’t hibernate in winter; that’s why they sometimes seek warmth and food in our houses! After a rain, you can sometimes spot tunnels mice dig under the snow to keep out of sight. Thanks to Creative Commons Photographer Greg Lasley for his photo of this little nighttime adventurer. A mouse investigated these exposed areas in the snow during the night. According to a delightful article in the New York Times, occasionally mice use their prehensile tails to climb small trees; line an abandoned nest with grass, milkweed fluff and feathers; tuck a snack under the lining and spend the night! 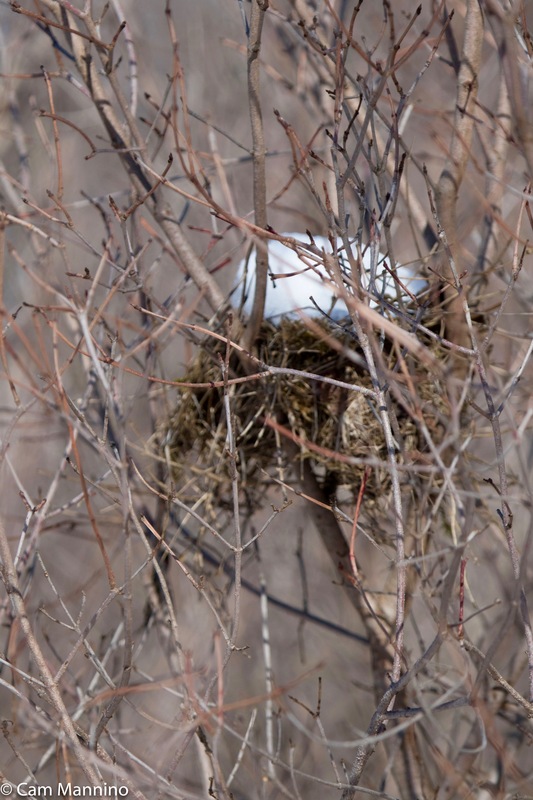 So I probably should have looked more closely at this nest which may have been made by an American Goldfinch (Spinus tristis), since it’s cup-shaped and wedged between several branches in a small tree. A White-footed Mouse might have found this nest a cozy place on a winter night. Perhaps a mouse at Cranberry Lake could tuck some of these Highbush Cranberries (Viburnum trilobum) into an abandoned nest for a midnight snack. 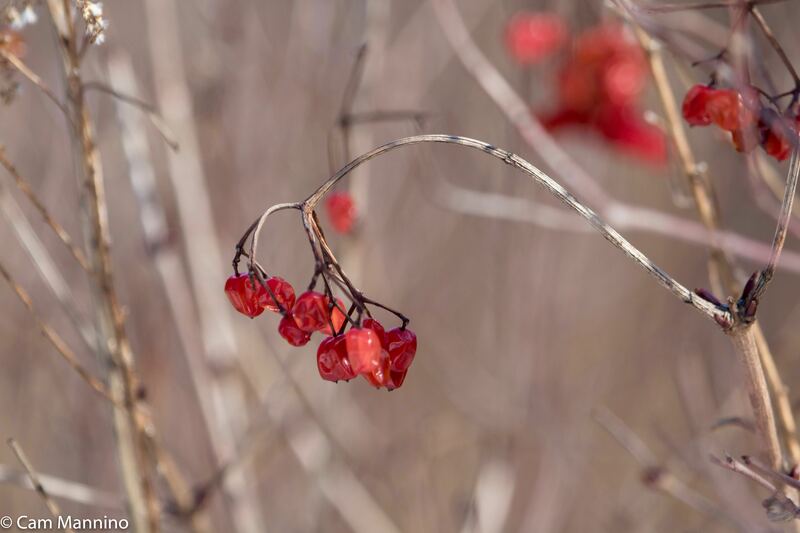 While not actually a cranberry, highbush cranberries might make a delicious snack for wildlife. Heading north from the meadow, a straight line of round prints led from the path to a pond. Two Canid prints, one on the top of the other, appeared inside each of these tracks in fluffy snow. I’m guessing it was a fox. Foxes travel in a straight line to save as much energy as they can while foraging. They also place their back foot inside the track of front one, probably for the same reason. (Dogs get fed, so their tracks wander all over the place!) The fox (if that’s what it was!) that left the tracks to the pond seemed to be headed out onto the icy pond – perhaps an easier path for a light animal than going through the brush. The fox on the right is a Red Fox (Vulpes vulpes) I saw trotting at dusk near our home. These canid prints led to the pond, the path of least resistance for a nighttime fox. On the path to Cranberry Lake, night wanderers left their marks. 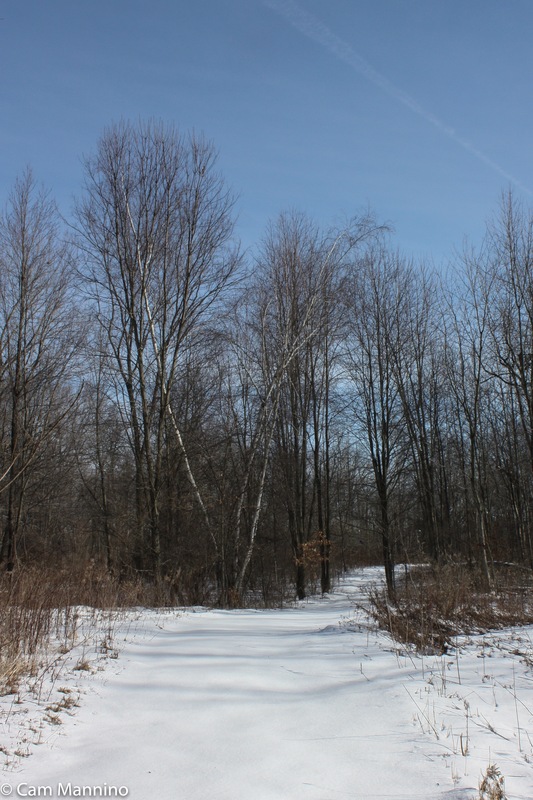 The birders noticed tracks (left below) of White-tailed Deer (Odocoileus virginianus) heading, like the fox, toward a frozen forest pool. We surmised that a Raccoon (Procyon lotor) left the five-toed tracks (center photo) which spread as the snow melted and then got covered in ice after a freezing rain. A possum waddled along under the shrubbery leaving its tiny pairs of five-pointed tracks (right) as it nosed in the snow. Raccoon tracks which melted and then were covered with a layer of freezing rain. What Occurred When We Weren’t Looking? One morning, a shallow puddle on the path had turned to ice but, wow! 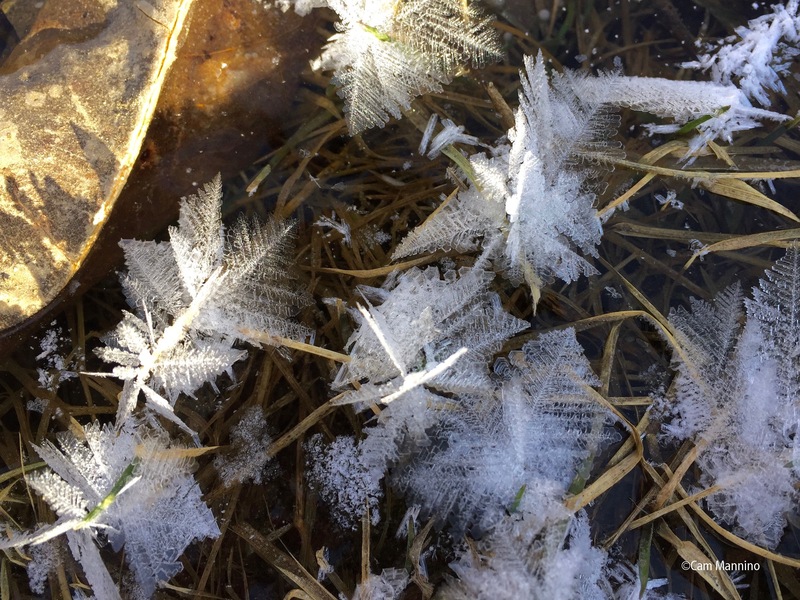 The surface was covered with 3 dimensional ice crystals, like tiny, leafy ice sculptures all over the puddle. 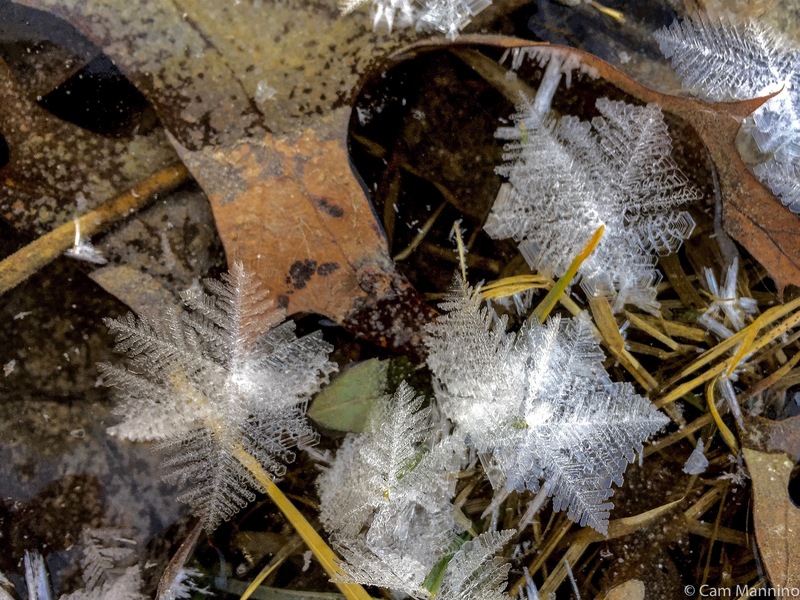 A frozen puddle covered with 3-D ice dendrites, a type of ice crystal. According to a website called SnowCrystals.com, these crystals are called Ice Dendrites. They form at low temperatures and high humidity, a condition which had occurred the previous night. 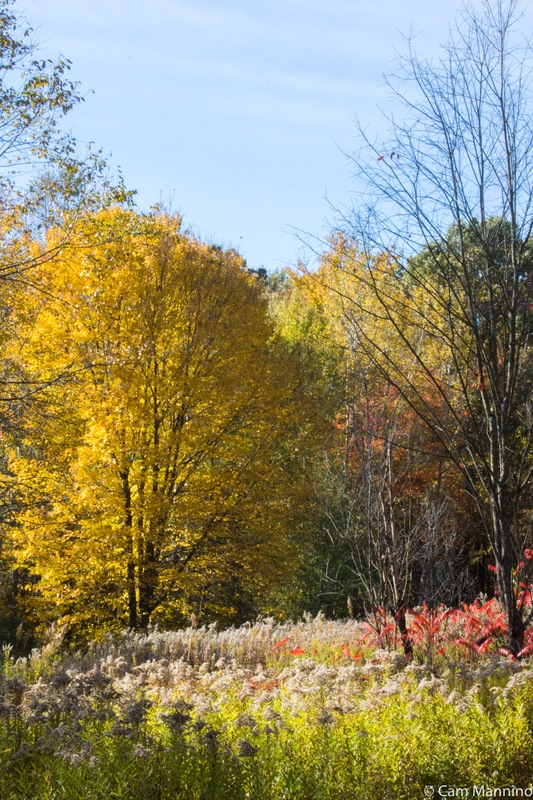 The word “dendritic” means “tree-like,” and indeed these do branch. I don’t remember seeing these free-standing ice crystals before, so I sat down in the snow and took a closer look. Amazing! 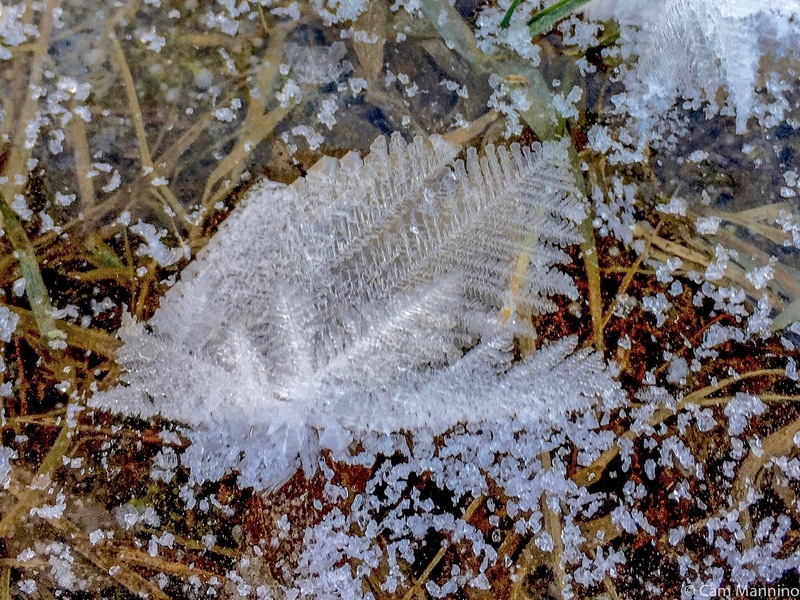 A free-standing ice dendrite, a kind of ice crystal, growing on the surface of a puddle at Cranberry Lake. 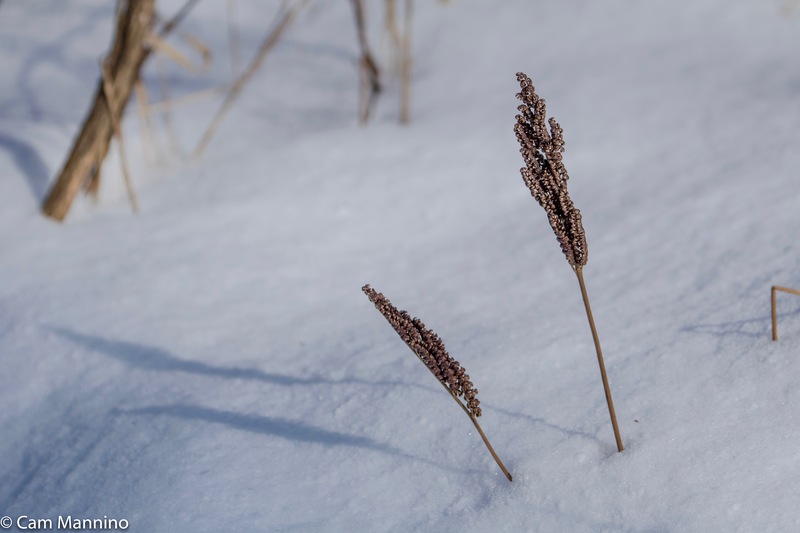 Near the large pond in the center of the park, the dark fertile leaves (or fronds) of the Sensitive Fern (Onoclea sensibilis) poked out of the snow. The underground stem of this plant (called a rhizome) is fed through photosynthesis by its large bright green leaves of summer. But the rhizome also produces separate, specialized dark fronds which are fertile and small enough to go unnoticed (at least by me!) in the summer. They support clusters of sporangia, little brown beads which contain the spores that will sail off in the wind next summer to start new plants. They give this interesting plant its other name, Bead Fern. Fascinating that these two photos are different leaves/fronds of the same plant. Sensitive Fern infertile fronds feed the rhizome, or underground stem of the plant in the summer. 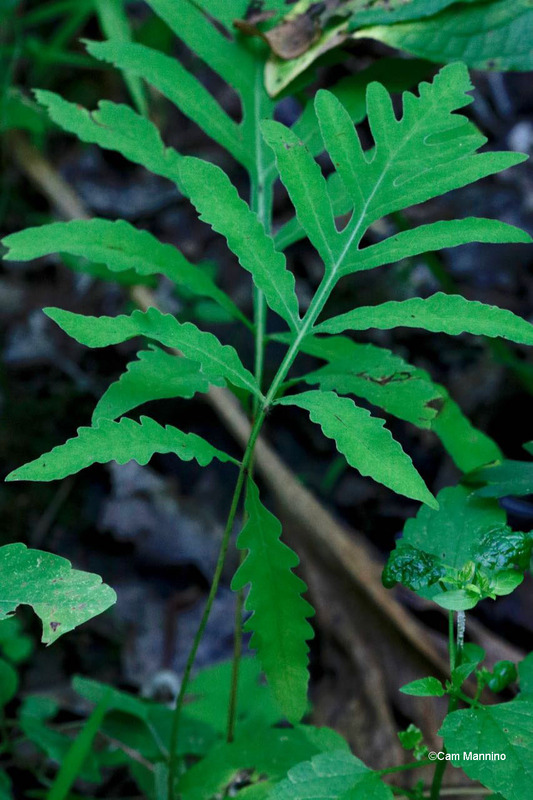 The fertile fronds that support the “beads” that contain the spores of Sensitive Fern. One icy morning I took a walk out onto Cranberry Lake. People were skating and ice fishing on the opposite side of the lake. 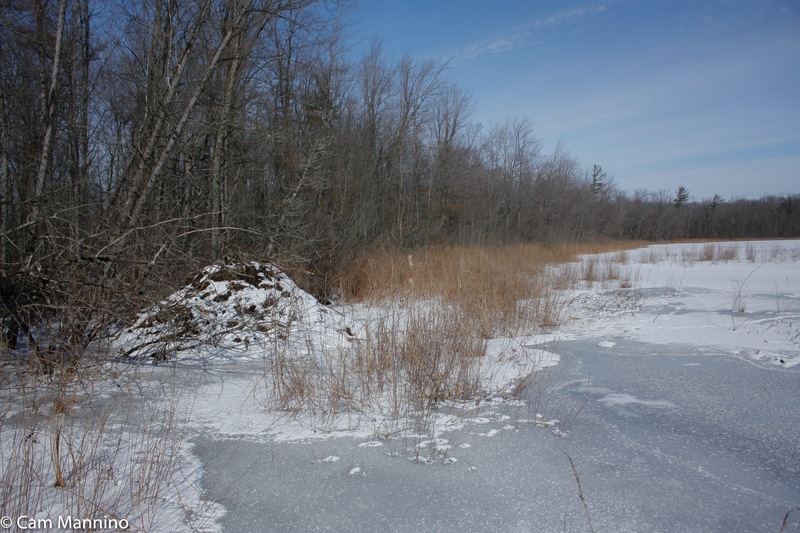 As I looked to my left, I caught sight of the very large lodge of a North American Beaver (Castor canadensis). 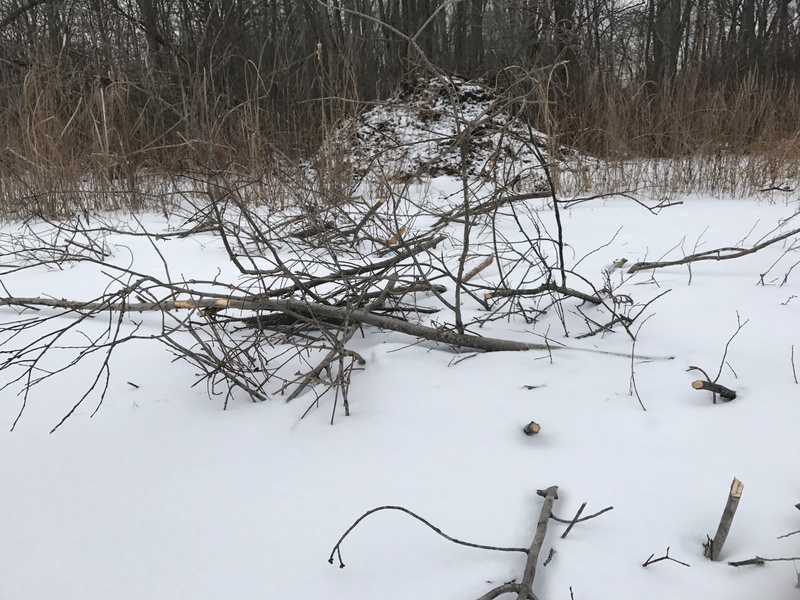 According to Northern Woodlands.org, beavers build lodges with branches, debris and grass, coating the surface with mud but leaving ventilation at the top. The entrance is safely under the water. Then they cut fresh branches and anchor them to mud on the lake bottom nearby so they can feed on the bark in the winter. You can see some protruding from the ice in front of of the lodge. Inside, the lodges have a feeding platform just above the water and a higher, drier sleeping platform covered with shredded wood fibers and grass. Beavers store fat in their tails, which shrink over the winter as the fat is used up. With a family of beavers inside plus snow and mud insulation, it’s a relatively snug place to spend the winter. So glad I could get out on the ice to see it! 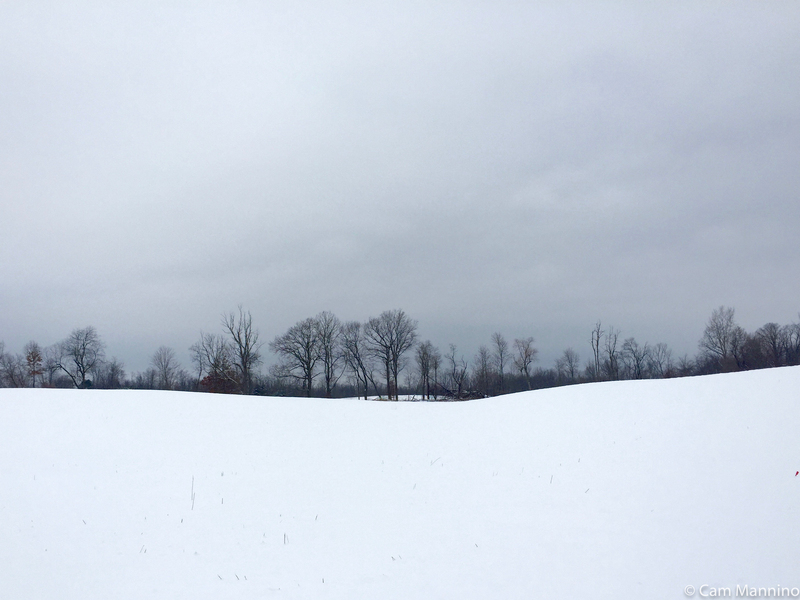 Winter walks are more challenging, but they have their compensations. It’s fun to be the first to step onto a pure white path on a snowy morning. 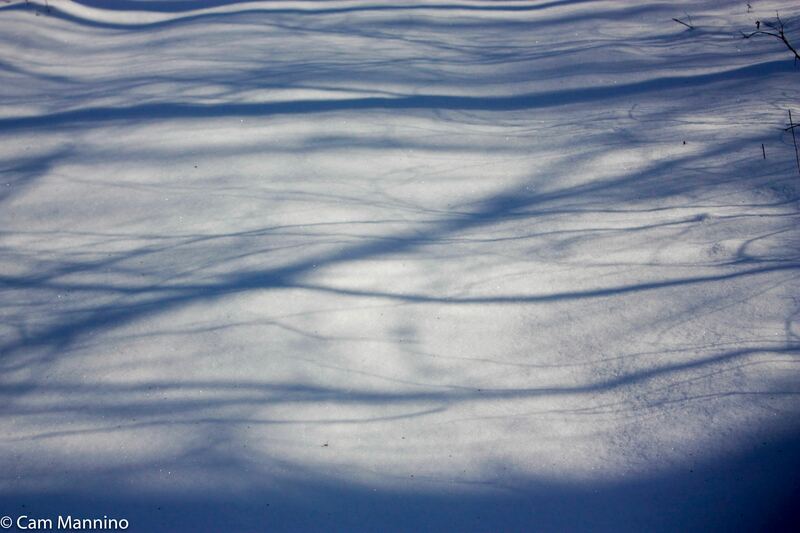 Blue forest shadows make patterns on the untrod snowy trail. Birds are fewer, more furtive and some are less colorful in the winter months, but hearing their group singing in a thicket or a distant call or tap is a companionable sound on a cold morning. 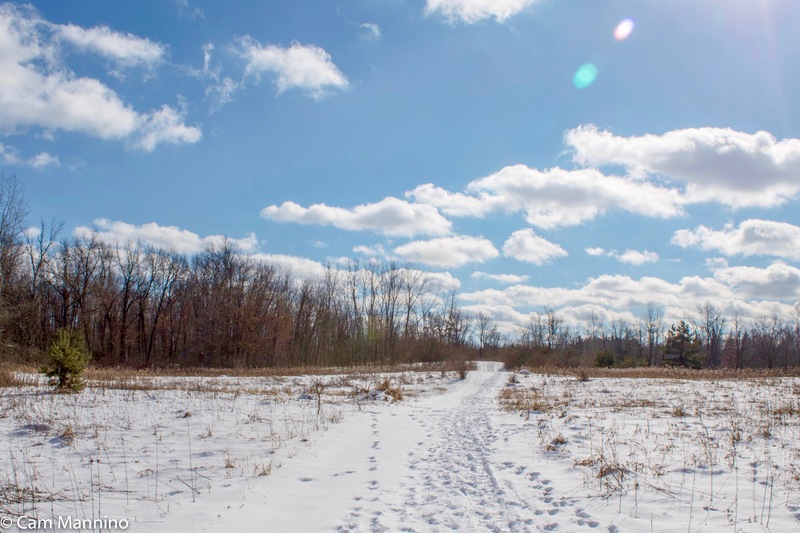 Tracks leading hither and yon help us imagine a moonlit night with a fox trotting across an icy pond or deer running with their white tails flashing in the darkness. 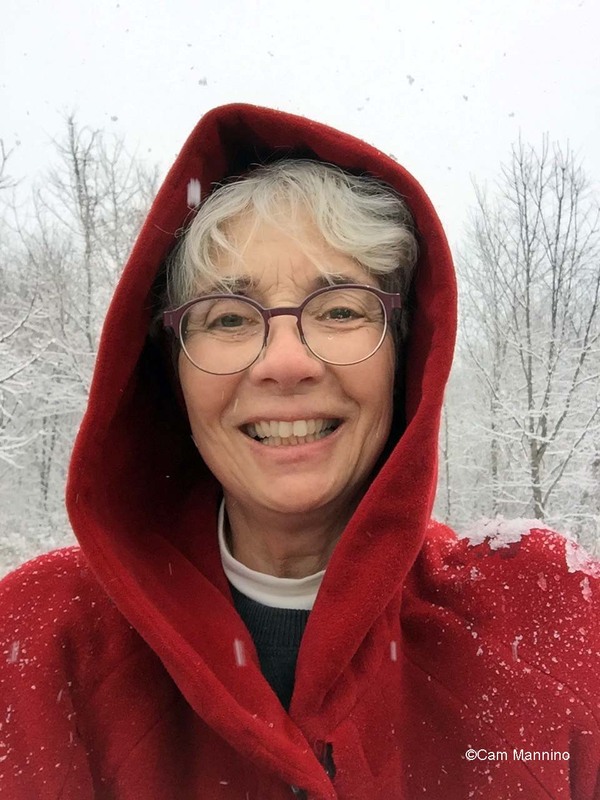 Following tracks like an amateur detective makes winter walking a bit of an adventure as we imagine the unseen world of Cranberry Lake on a winter night.